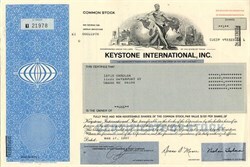 Beautifully engraved uncancelled certificate from Keystone International, Inc issued in 1997. This historic document was printed by United States Banknote Company and has an ornate border around it with a vignette of an allegorical man. This item has the printed signatures of the Company's Chairman, Nishan Teshoian and Secretary and is over 11 years old. 1997 - Keystone International, Inc., with annual revenues of approximately $700 million, designs, manufactures and markets on a worldwide basis, industrial valves, actuators and accessories used to control the flow of liquids, gases and solid materials. Keystone products are sold to the food and beverage, water and sewage, petroleum production and refining, natural gas, chemical, power, pulp and paper industries.